Jim's Pest Control - Home Pest Control Sydney offers a full range of trusted home pest control methods for the effective control of Birds, Spiders, Rats, Wasps and Termites in Sydney homes. We also provide in depth pest control and riddance methods in commercial premises, including offices and hotels.Our effective commercial and home pest control techniques have built us a strong reputation amongst the Sydney community. Jim's Pest Control - Home Pest Control Sydney's technicians are trained to carry out visual inspections for signs of pests in your home, using the latest technology in Home Pest Control. For your peace of mind, Jim's Pest Control - Home Pest Control Sydney's Home Pest Control and treatment methods are Environmentally Friendly and most of all highly effective. With over 20 years experience we guarantee you will be satisfied with the exceptional results we provide - Freedom from Pests! For your convenience, we are open 7 days per week. Our friendly, reliable service and effective Home Pest Control methods have built us an excellent reputation as one of the most trusted companies in the Home Pest Control industry. Of all the thousands of Australian spiders, arthropods and insects, only three spiders have bites which are capable of causing death - the funnel-web spider (and related atrax species), the red back spider and the paralysis tick. 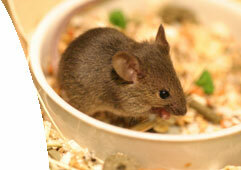 Mice spread disease and contaminate your food, as well as cause damage to buildings. They build nests and burrows in and around your home, causing a nuisance to you and your family. Mice are accustomed to living in close quarters with humans, sharing their food and shelter. 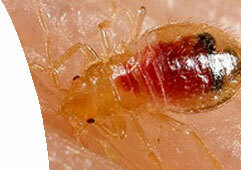 Their fleas and lice can infect you and your pets. The Bed Bug hides in cracks and crevices during the day and come out at night to feed on their host, which are humans, birds and house hold pets. Their bites often go unnoticed by the victim. However, after the feeding the site may become inflamed and severely itchy in sensitive people. Ants are the most persistent pests in around homes and buildings. Ants hollow put wood for nesting and cause structural damage. They can contaminate food, damage plants and kill seedlings. 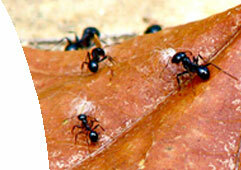 The most common ants in Sydney are the Black House Ant and the White Footed House Ant. They nest in places such as paths, wall cavities and potted plants.